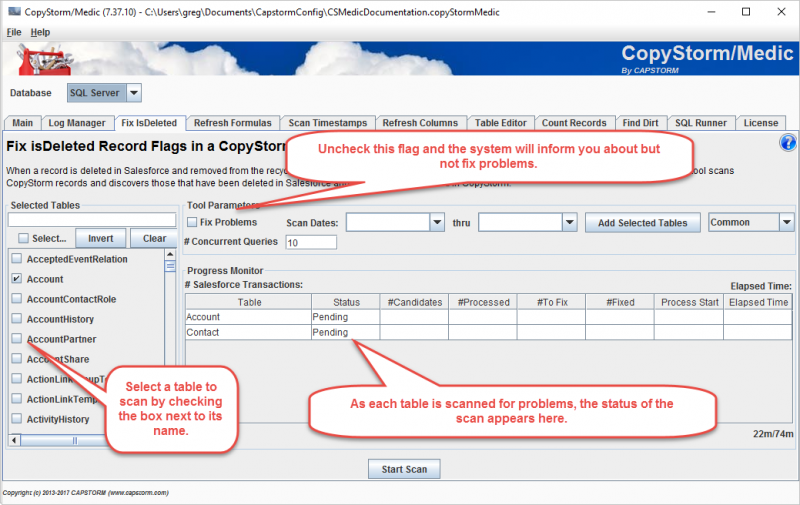 The CopyStorm/Medic Fix IsDeleted tool identifies records that have been deleted in Salesforce, removed from the Salesforce recycle bin, but not marked as deleted in CopyStorm. A Salesforce API program does a hard delete on Salesforce records. A hard delete bypasses the Salesforce recycle bin mechanism. Under normal circumstances, when a user deletes a record in Salesforce the record is not really deleted immediately. Instead, it is placed in the Salesforce recycle bin. The mechanism used by Salesforce is a hidden field named “isDeleted”. When CopyStorm runs it copies all modified records — including those where the “isDeleted” flag is set to true. After records are copied by CopyStorm, they are optionally deleted in the CopyStorm database based on parameters set on the Advanced tab. If normal Salesforce accounts are not permitted to empty their recycle bin (a good practice) then the condition that needs this tool will likely not occur. The top part of the dialog has parameters that determine if problem records should be fixed.